Location: After checking, at International Departures Terminal, Mezzanine. Bangkok Airways has introduced its new Boutique Lounges (Boutique Lounge and Blue Ribbon Lounge) at both Phnom Penh International Airports, Cambodia to provide comfort and convenient for passengers while waiting for their flights. Passengers of Bangkok Airways traveling on Phnom Penh – Bangkok route can now enjoy brand new lounges where passengers can treat themselves to a multitude of free snacks and various choices of hot or cold drinks, free Wi-Fi Internet access. Airlines listed below provide on-site ticketing services (booking, purchasing of plane tickets, changing flights etc.) These ticketing booths are located in the check in area, below the escalator for International Departure. 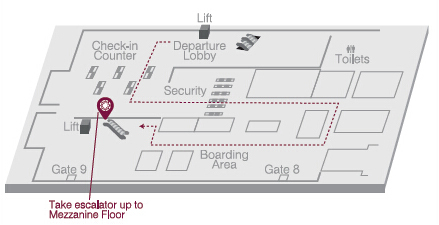 The smoking lounge is located in the boarding area in front of gate 9/10. The post office is located in the check-in area near the airline’s service counters. The prayer room is located in the boarding area near gate 5. For your convenience travelling with young children, we have furnished Baby Rooms, where you'll find hot water dispensers and the privacy to attend to your baby.